After the Supreme Court unanimously held in March that New York’s credit card surcharge law regulates speech, the Second Circuit has taken up the case again. As a refresher, New York General Business Law § 518 provides that that “[n]o seller in any sales transaction may impose a surcharge on a holder who elects to use a credit card in lieu of payment by cash, check, or similar means.” That prohibits retailers from charging a surcharge to consumers who pay for things with credit cards, but allows the retailers to offer a discount to those who pay in cash. Five New York businesses challenged the statute as a violation of their First Amendment rights by impermissibly regulating how they communicate their prices to customers. 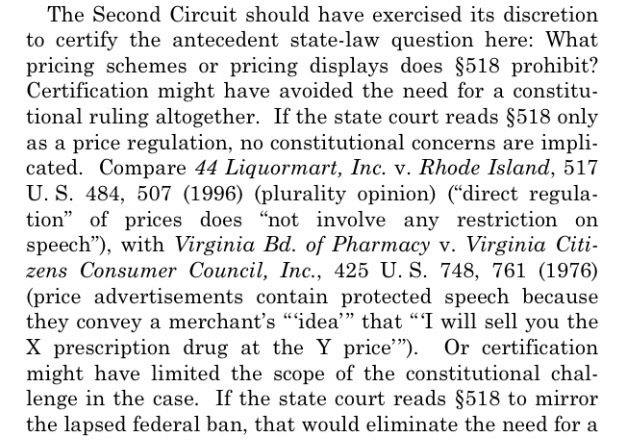 (1) Whether as applied to the retailers’ proposed single-sticker pricing scheme, where the retailers would advertise one price, but charged a slightly higher price to customers who pay with credit cards, General Business Law § 518 is “a valid commercial speech regulation under the four-part analysis laid out in Central Hudson Gas & Electric Corp. v. Public Service Commission of New York, 447 U.S. 557 (1980)?” In Central Hudson, the Supreme Court held that courts considering a restriction on commercial speech must evaluate: (1) whether the commercial speech concerns lawful activity and is not misleading, (2) whether the asserted governmental interest is substantial, (3) whether the regulation directly advances the governmental interest asserted, and (4) whether it is not more extensive than is necessary to serve that interest (id. at 566). The first criteria seems to me the most relevant here, whether the retailers’ proposed single-sticker price is misleading to the customers when that is not the price that will be charged when the customers use credit cards. (2) Whether as applied to the retailers’ proposed single-sticker pricing scheme, General Business Law § 518 is “a valid disclosure requirement under Zauderer v. Office of Disciplinary Counsel of Supreme Court of Ohio, 471 U.S. 626 (1985)?” In Zauderer, the Supreme Court upheld an Ohio attorney advertising regulation requiring attorney advertisements for contingency cases to disclose when the potential client will have to pay for the expenses of the litigation if the claims did not succeed. The Court reasoned, because the potential client didn’t understand the difference between legal “fees,” which would not be due for a losing case, and “expenses,” which could be, the disclosure requirement compelling attorneys to say more than they wanted to about the potential costs of the case was a valid regulation of the commercial speech. Is the same true of section 518, the Second Circuit asks? Can the New York credit card surcharge ban be viewed as a valid disclosure requirement so that customers aren’t confused when they see one advertised price, but are charged another when they use a credit card to pay? The parties now have until June 13th to provide the Second Circuit with answers to these questions, after which the Court will decide whether to certify the interpretation question to the Court of Appeals, whether to hold oral argument, or whether to just decide the case on its own. I think Justice Sotomayor’s points are well taken. If the Court of Appeals is asked to interpret General Business Law § 518, the Court’s guidance would go a long way to deciding or at least limiting the retailers’ challenges to section 518. From the way the questions are structured, I wouldn’t be surprised if that is the route the Second Circuit decides to take. The Second Circuit’s order can be found here.